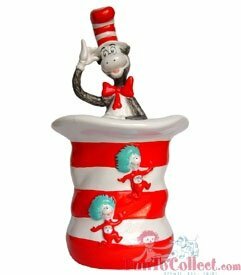 Cat in the Hat Ceramic Cookie Jar Dr. Seuss Very Large will hold lots and lots of Cookies You will also find THING 1 AND THING 2 ON THE COOKIE JAR Give the Cookie Jar with the Book for a Perfect Gift !!!! If you have any questions about this product by Dr. Seuss, contact us by completing and submitting the form below. If you are looking for a specif part number, please include it with your message.